Above: Tommy Walker and other owners of Project Reo Collective gather at their coffee shop, Sept. 30, 2018. Where a business is located in San Diego County can have a big impact on whether it receives a bank loan, according to federal data. The data shows that businesses in low-income or high-minority census tracts were far less likely to receive funds from banks. A federal law, the Community Reinvestment Act, requires large banks to report the number and amounts of loans of under $1 million that they make to businesses by census tract. This includes traditional loans, lines of credit and credit cards. Where a business is located in San Diego County can have a big impact on whether it receives a bank loan, according to federal data. Here's how these local business owners got their businesses started. The Woodstock Institute, a nonprofit research and advocacy organization, conducted a report on this data in 2017. Spencer Cowan, the author of the report, updated the data and localized it to San Diego County for KPBS. He found that between 2012 and 2016, only about one in five businesses in low-income areas of San Diego County received a bank loan, compared to almost four in five businesses in high-income areas. "That means four out of five don't even have a business credit card," he said. "You're essentially a cash basis business at that point. If you need to buy office supplies you have to either get a merchant cash advance or tap into your own personal funds." 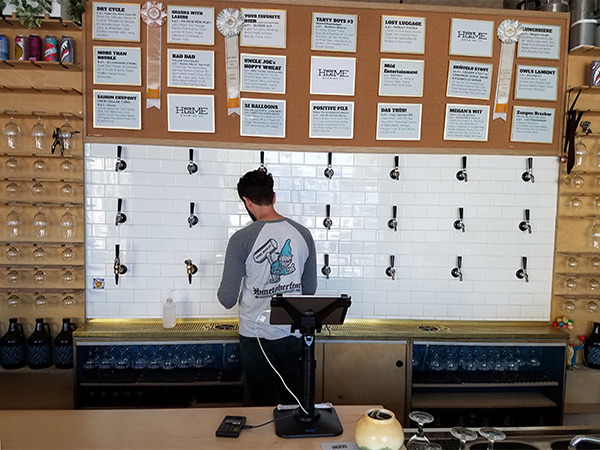 Cowan also found that San Diego businesses in low-income census tracts received under 5 percent of the total number and amount of loans, while businesses in upper-income census tracts received just under half of the total number and amount of loans. The lack of lending creates patterns of disparity in cities, he said. "Businesses don't get started, so employment stays depressed," he said. "The job opportunities aren't there in the neighborhood. Businesses that are there don't expand because they can't afford to. So you have a cycle that perpetuates that neighborhood being less friendly to business." What's more, businesses unable to get bank loans may turn to predatory lenders that can leave them worse off, Cowan said. That was true for Natalie Gill, who has been running the flower store Native Poppy in North Park for almost three years. She had a vision for a different kind of flower store. "Most flower shops, you go in and you have to say, you know I'm looking for something for my grandma, I want to spend $50," Gill said. "And you have no idea what size that's going to be, what their styles are going to be, what vases you get." Native Poppy, which shares space with a coffee shop, is set up differently. They have a flower menu that helps customers make decisions. 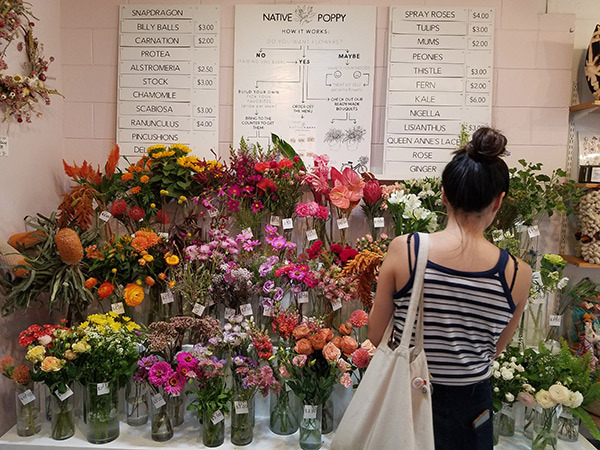 A flower menu at Native Poppy shows customers their options, Sept. 5, 2018. Gill's business is flourishing, but things didn't always look so rosy. She put $20,000 of her own savings into opening the store but needed about $40,000 more. "I went to a bank asking for a loan and the process was complicated and long," she said. "And I needed the money right away. I had already signed the lease taking a bet that I would get the funding. I had two years of experience with profit, but I don't know what it was, but I got rejected for every loan I tried for." So instead, she did something risky: she took a loan from an online company. "It was a $24,000 loan that would get deposited into my bank account the next day," she said. "But it was at 18 percent interest and I had to pay it within three years, which was a risk I was willing to take because I had no other options." George Thornton had a similar experience. He's the owner of the North Park beer brewing supply store The Homebrewer, and in 2014 decided to expand his store to also become a brewery, Home Brewing Company. But he had trouble getting a bank loan. "I had about eight different brokers tell me in their initial contact that there would be no problems at all based on our three to four years in business, and the revenue we were generating on the retail side," Thornton said. "Inevitably, when they looked at my personal credit score, and credit card debt that we had accumulated because of the business, they always told us that there would be no way they could work with us." George Thornton works at his North Park brewery Home Brewing Company, Sept. 6, 2018. But Thornton was committed to expanding, so he took out a loan from the company Square, which makes those white chips you use to pay by credit card on a tablet or smartphone. The terms of the loan were steep: Square would keep 20 percent of all sales Thornton made using the white Square chip until the loan was paid off. "Businesses turn to all sorts of creative measures to make it work," said Lauren Grattan, a founder of Mission Driven Finance, a San Diego investment company. "They're turning to informal networks, or sometimes turning to online predatory lenders that will just bury their business." 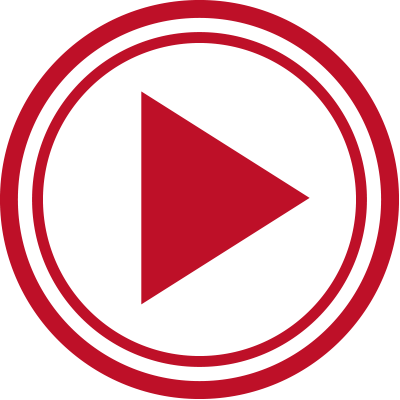 Grattan works with business owners to help them find funds that best fit their needs, and makes a few loans directly to small businesses. As hard as it is for any small business owner to get funding, it's even harder for businesses in areas largely populated by minorities. According to Cowan's analysis for KPBS, as the percentage of minorities in a given area increases, the percentage of businesses getting loans decreases. In San Diego census tracts that are 80 percent or more minority, about 35 percent of businesses get bank loans, Cowan found. In low-minority census tracts, more than 75 percent of businesses get loans. 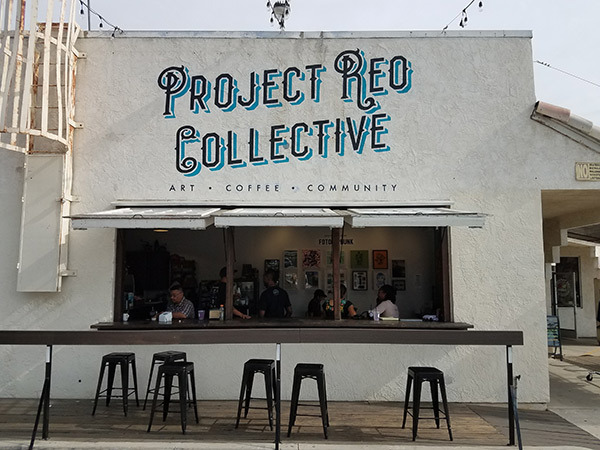 That rings true for Tommy Walker, who two years ago teamed up with four other families to start a coffee shop called Project Reo Collective in Paradise Hills. "It started out as five families who got together from cleaning up the neighborhood here," he said. "As we cleaned up the community, a lot of people in the neighborhood said, we wish we had somewhere to hang out, somewhere we grab a cup of coffee, meet our neighbors, do some homework or study." A lavendar lemonade and a Mexican mocha at the coffee shop Project Reo Collective, Sept. 30, 2018. True to Cowan's findings, Project Reo started not with a bank loan, but with investments from the five families. And then when they went to a bank asking to borrow $4,000 for an espresso machine, they were rejected, Walker said. They ended up borrowing money from one of the owners' parents and now they're serving Mexican mochas and lavender lemonades. But, Walker said, they shouldn't have had to do it on their own. "Some neighborhoods might not get the recognition or even the financing that they deserve or even just the help that they need," he said. "But as long as you have families like us, we want to put it out there to let any other neighborhood know, just go out there and just make it happen." 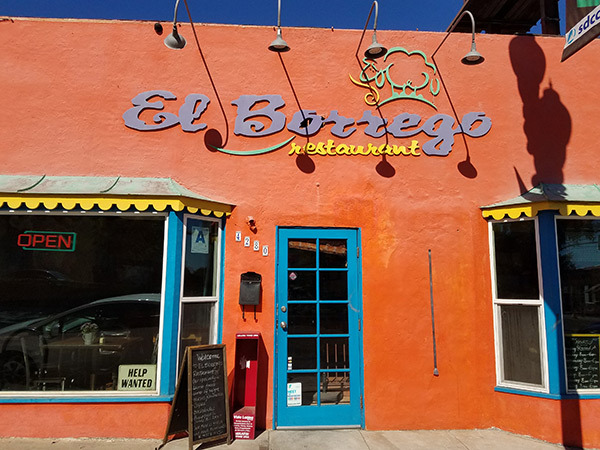 Rodnia Attiq also started her business, the Mexican restaurant El Borrego in City Heights, without a bank loan. In fact, she didn't even try to get one. "We didn't believe in loans and all that money from other people, from banks, because we're small business owners, we never thought a bank would hear us," she said. She and her mom started selling lamb tacos in 2005 to fill what they saw as a gap in the city's food scene. "My mom said, 'you know what, there are no lamb tacos in San Diego, so let's do it,'" Attiq said. "And we start in the driveway. It was only Saturdays and Sundays from 8 in the morning until 2 p.m. and we were running out of lamb. At maybe 1 p.m., we had no lamb at all, and that's why we said, 'you know what, this could be a business.'" Rodnia Attiq works in the kitchen of her restaurant El Borrego, Oct. 3, 2018. Recently, Attiq has been working to expand her restaurant to make an outdoor event space in the vacant lot out back. "Our venues are going to be the secret garden of the restaurant," she said. She applied for and was granted a Small Business Administration loan, not from a bank, but from a local nonprofit that oversees these government loans. "We're taking that next step and getting to the next level that we have been working for the last 13 years," she said. "So I think we're finally getting there." Attiq said the project won't just expand her business, it'll allow her to hire more employees and give people in City Heights a place to gather for big events and enjoy her food.